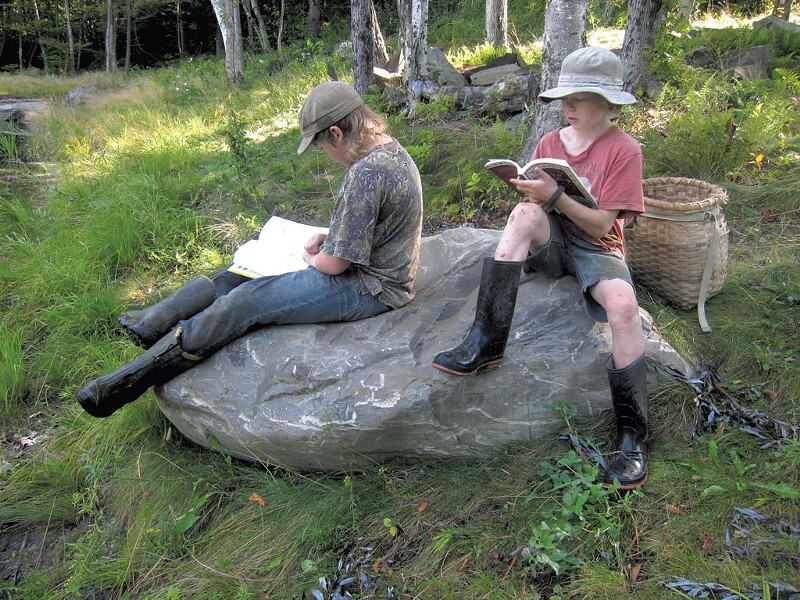 A Cabot Family Makes the Case for "Unschooling" | Features | Kids VT - small people, big ideas! 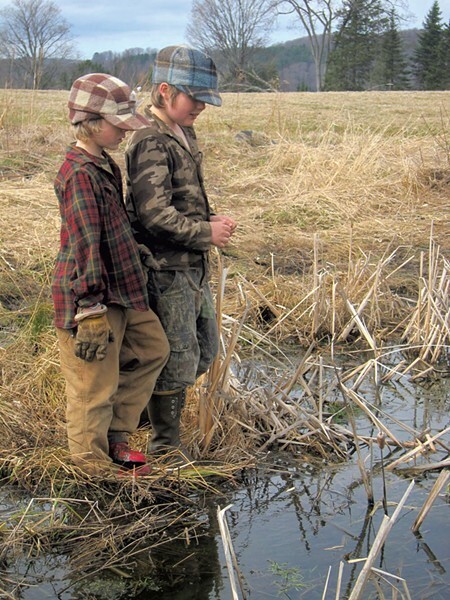 A Cabot Family Makes the Case for "Unschooling"
Fin and Rye Hewitt are boys on a mission. On a cool afternoon in late summer, the two boys tear across the 40 rolling, green acres in Cabot that they call home — on bicycle, by foot, at a run and occasionally on a thoughtful walk. There are pack baskets to shoulder, trapping manuals to read, cats to chase and blueberries to pickw, and woods to roam in pursuit of who knows what other projects. If, at 12 and 9, they don't exhibit the wistfulness that nags at other kids at summer's end, it's because there's nothing to be wistful about. When the vast majority of school-age children in Vermont head back to the classroom this week, the Hewitt boys won't be among them. They don't attend school, and never have. Nor do they follow any kind of set curriculum. No math homework, no required book reports, no lectures on American history — just the freedom to explore and, in the process, learn. Or so their parents trust. The commonplace shorthand for this kind of learning — "unschooling" — doesn't sit particularly well with the boys' father, Ben Hewitt, but he concedes it rolls off the tongue more easily than the alternative: self-directed, adult-facilitated life learning. That's the topic of Hewitt's latest book, which will be out September 9 from Roost Books. 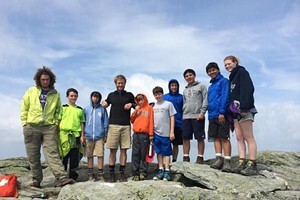 In Home Grown: Adventures in Parenting Off the Beaten Path, Unschooling, and Reconnecting With the Natural World, he writes at length about educating his children at home — or rather, allowing his home to educate his children. And what a home it is. Ben and Penny Hewitt purchased those 40 acres of field and forest in Cabot in 1997. A year later, they built "the quintessential Vermont hippie shack," says Hewitt, which they expanded in 2001. The couple did most of the building themselves, and financed much of it out-of-pocket — choices that give them the autonomy to work from home full-time. Theirs is not a trust-fund story, but one of scrimping and saving and holding priorities that, Hewitt writes, are unconventional in modern society. In the years since, the Hewitts have cultivated abundant gardens, fruit trees and berry bushes. A few cows graze in one of the pastures; the family also keeps ducks, chickens, sheep and pigs, as well as a few goats tended by their sons. Hewitt estimates that the family grows 90 percent of what it eats. Here, and not in the confines of a classroom, is where the Hewitts want their sons to grow up. "Of all the things I want for them," writes Hewitt in the early pages of Home Grown, "connection to place and a sense of knowing how they fit into this world usurps all others." He can't guarantee that connection will take root, just as no parent can know what will become of his or her children. "But I also know what I have seen," he writes, "which is that the more freedom and autonomy I allow my children to follow their passions and to learn on their own terms, the more passionate and eager to learn they become." 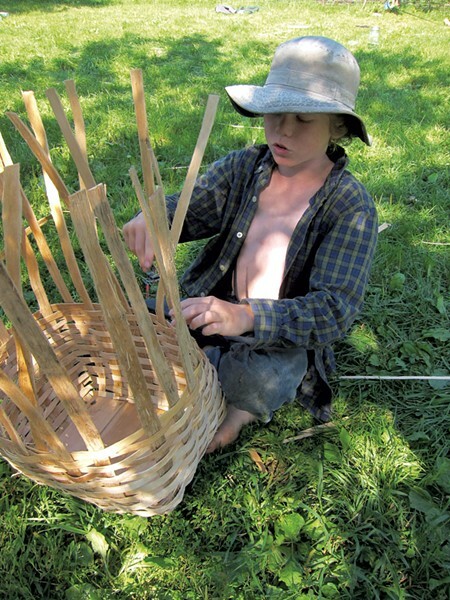 The boys' handiwork and interests are visible everywhere: in Rye's pack basket, which he wove himself; in the handle Fin crafted to fit an old axe head; in shelters built in the woods and bows fashioned by hand. The Hewitts always knew they wanted to educate their children at home, but they initially expected that would look a little more like conventional homeschooling. Inspired by the Waldorf system, which emphasizes teaching basic skills through crafts and other creative pursuits, the couple decided to institute some structure when their older son, Fin, was about 5. They sat him down at the kitchen table with a ream of paper and expensive pastels — but, to their dismay, he wasn't having it. Fin just wasn't the kind of kid suited to sitting quietly and drawing. "It forced us to liberate our thinking about what constituted education," says Hewitt. The term unschooling dates to 1977; that's when John Holt, author of the 1964 treatise How Children Fail, coined it in his magazine Growing Without Schooling. Holt argued that institutional schools diminished the natural curiosity that children bring to learning, and advocated strongly for homeschooling. But when he realized that some parents were simply replicating the structures of institutionalized education at their kitchen tables, he proposed a new approach: unschooling. Today, more Vermonters than ever are choosing to educate their children at home. State figures show 2,384 children were enrolled for "home study" last school year — up nearly 18 percent from a decade ago. Meanwhile, enrollment in Vermont public schools fell 14 percent over the same period, largely due to the shrinking population of school-age kids in the state. Last year, homeschooled children constituted nearly 3 percent of the total number of registered students in Vermont. State law requires that children between the ages of 6 and 16 be enrolled in a public or private school — or register for home study with the state. In order to enroll, a family must prepare and submit a detailed outline or narrative describing the content of the home-study program, meeting predetermined areas of study such as basic communication, fine arts and natural sciences. Though followers of unschooling don't adhere to a set curriculum, the categories are broad enough to allow for some flexibility. For instance, instead of listing the textbooks a child might study for science, an unschooling parent could provide examples of alternative, educational activities — such as walks in the woods to learn about wild edibles. It's a hoop to jump through that, at some level, runs counter to the ideals of unschooling. That said, it's not hard to break down Fin and Rye's interests into the subjects they might study in school, said Hewitt, who was preparing for the year ahead: geography; reading and writing; anatomy; earth sciences. But that's not the point, writes Hewitt in Home Grown. "Such segregation is not the way of the natural world ..."
The state also requires an annual assessment, which can take the form of a visit from a licensed teacher, a parent report including a portfolio of student work, or standardized test results. It's unknown how many of the children studying at home in Vermont are unschooled. But longtime homeschooling advocate Retta Dunlap, who lives in Woodbury, suspects the approach is growing more popular among families fed up with, or failed by, institutional school systems. "I've done it all, from videos to workbooks to unschooling. You name it, I did it," says Dunlap, who homeschooled her four kids. "I used whatever method worked to get my children learning." Those children now range in age from 26 to 32; all have gone on to satisfying professional careers, and two own a software-development company. Dunlap remains a go-to authority and resource on homeschooling for many families and policy makers in the state. To those curious about unschooling, she warns that the unstructured approach typically involves more work for parents than following a set curriculum. "It's not [that] you can sit and watch TV every day and the kids are off unschooling themselves," says Dunlap. Parents have to be willing to help their children chase down answers or resources when they don't have them at their fingertips, and indulge their curiosities. "It's parent-intensive," she says. "The whole point is for this child to have a rich learning environment to bounce around in." Give them that, Dunlap says, and kids will learn. That's similar to the answer Hewitt finds himself giving those who pepper him with questions about unschooling. Chief among those questions: But how do your kids learn, if not in a classroom? "Children learn," he says. "You can't really stop them." Consider Fin and Rye. They're curious, capable children. They taught themselves to read by about age 8. They learned penmanship in part by filling out hunter-safety manuals, and by sending letters to friends and family and keeping journals about their exploits. Occasionally they'll fire up YouTube to watch an instructional video, but Hewitt estimates they spend fewer than 10 minutes a day on the computer. They've acquired skills, too, uncommon in most classrooms. Both boys are avid hunters and trappers; Fin, the older, made his first kill — a chipmunk — at 6, with a homemade bow and arrow. He skinned and dressed the critter and roasted it over a fire, and told his father, "Here, Papa, try some." They're not being raised in a vacuum, either. The Hewitts have engaged mentors who've taught the boys wilderness skills, trapping ethics and how to play the banjo. The boys frequently spend time with their neighbors, including an older dairy farmer whom they help with chores. They belong to a small group of homeschooling families that convenes once a week for an afternoon of skill sharing. Hewitt is relieved that, so far, Fin and Rye don't display the kind of painful self-consciousness he experienced as a child in school. There's no one to judge the clothes they wear (faded camouflage and rubber barn boots, mostly), or the games they play, or the company they keep. "I want them to be social," says Hewitt. "I don't know that I want them to be socialized." And though it may sound cliché to reduce parts of their day to "teachable moments," those times do crop up — often. Take the pack baskets the boys recently learned to make. They weave the baskets from black ash wood and have learned from experience that the wood needs to be wet and supple. That sparked an impromptu lesson about intra- and extracellular moisture. Another example: The Hewitts read together as a family every night, and recently Rye interrupted the evening's story with a question. What did the word "panache" mean? They chatted about the definition and pulled out the family's dictionary. Is there really a need for vocabulary quizzes or worksheets amid moments like that one? "It bubbles up all the time," says Hewitt. "There's no need to really sit down and segregate this subject material in the way that is so common. We have this institutionalized, monoculture educational system, and that's exactly what makes kids sour on learning." It's a frustration Hewitt knows firsthand. Burned out on school and unconvinced of its relevance for his life, he dropped out at 16, the so-called "school-leaving age" in Vermont. He went on to work a series of jobs in various trades, mostly construction. A few years after dropping out, Hewitt began rising early every morning to write, not because of any school assignment but because of some innate desire. He went on to a successful career as a freelance writer; his articles have appeared in numerous national magazines, including the New York Times Magazine, Wired, Discover and, most recently, Outside. He authored three other books before Home Grown: Saved, The Town that Food Saved, and Making Supper Safe. "Schools have gradually become more and more oppressive in a variety of ways," says Peter Gray, a Boston College psychologist who authored the 2013 book Free to Learn: Why Unleashing the Instinct to Play Will Make Our Children Happier, More Self-Reliant, and Better Students for Life. He pointed to the Boston public schools, where elementary schoolchildren have only 15 minutes a day of recess — "and that's out in something that looks like a prison yard," says Gray. "Twenty percent of boys in our schools are getting diagnosed with ADHD at some point before they graduate," he continues. "We're beginning to realize, hey, there's something wrong here. We hear all this propaganda about the importance of school, and test grades, and I think there is starting to be a real backlash about it." Gray stumbled into the world of unschooling while giving talks about the importance of play in education at various workshops and conferences. But he has some personal experience with the subject, too; Gray's son rebelled in school in the 1970s and ended up at the Sudbury Valley School — an alternative school without grades or curriculum and with many of the same tenets of unschooling. His research gradually evolved to focus on what became of students educated this way, and eventually to the importance of play in a child's upbringing. Speaking on the subject at conferences attended by unschoolers and their families, he found himself impressed by the kids. Still, Gray wondered, with a bit of skepticism: "Can you provide at home the kind of environment that I felt was necessary for children to become educated when they're in control of their own schooling?" Gray has undertaken two surveys with parents and adult unschoolers. He found 83 percent of the grown-up unschoolers had gone on to some form of higher education, with 44 percent completing or currently working on a bachelor's degree. (Many of the others had gone specifically for skills or licenses related to vocational interests that did not require a bachelor's degree.) Their chosen careers included urban planner, field biologist, archaeologist and textile artist. What's more, the vast majority reported that their childhood avocations had turned into careers. The most frequent disadvantage to unschooling that the survey participants reported? Dealing with other people's opinions. I arrived at the Hewitts' farm with a baby in tow; my usual babysitter was out of town, and I figured that if ever there was an interview for which a toddler might be welcome, it must be this one. Asa, at nearly 14 months, dozed on the long drive to Cabot and woke up to a picturesque farm scene. I walked the fields of the Hewitts' farm on what Ben Hewitt called the nickel tour, the baby on my back. Asa pointed at cows, cackled over Rye's goat kid, Monkey, and, when I set him loose in the front yard, proceeded to eat a bit of dirt and chase the family dog. One eye on the kid, the other on my notebook, I marveled at Hewitt's easy confidence in the path he and his wife have chosen for their family. In a later interview, Dunlap would tell me that it's often hard for parents to trust homeschooling, no matter what method they choose. "We parents seem to trust it up to the age of 3 to 5," she says. "The kids learn to walk and eat and talk and dress." But when a child hits the age we associate with the onset of schooling, many parents assume schools must better facilitate learning. Fin and Rye tore through the front yard. Asa watched them go and turned back to, well, eating dirt. I spent the next several days wondering, often: Should I send this child to school? In Home Grown — a meditative, thoughtful treatise on rural living and lifelong education — Hewitt acknowledges that not every family will have the capacity, or desire, to educate their children at home in this kind of freewheeling, free-ranging manner. Of course, not everyone who unschools needs a farm and 40 acres. Plenty of families unschool in cities and suburbs; their children's classrooms become city streets and parks and museums instead of woods and barns. What families do need, though, is at least one parent or caregiver at home with children. Some families that might wish to educate their children at home simply can't, and schools provide a place for children to go while parents work. "It's not feasible for everybody," agrees Hewitt. "I can't answer everyone's personal educational crisis with our experience." But what is feasible, he says, is to look for ways this model — unschooling — might assist in rethinking what an education can and should be. He does have some advice for those curious about applying the principles of unschooling to their more structured lives: Don't schedule your kids "to the freaking hilt," he says. Give them time to be kids. He writes that he doesn't want to be "overtly prescriptive," but Hewitt has some concrete advice. Play hooky now and then — take a day off work, and pull the kids out of school, without an agenda or plan. Cancel nonessential plans and stay home. Equip your children to be of use, and remember that even if they're not productive, they're learning to be resourceful and confident. Gray has his own recommendations: He warns against putting too much pressure on children about grades or academic achievement or even attending a prestigious college. "If you can avoid looking at the report card, and just sign it, do that," he says. "Don't add extra stress and extra pressure." I'm not the only one engrossed in — and a little beguiled by — Hewitt's choices. His book has yet to hit the shelves and he's already causing a stir: As of last week, his article about unschooling in the September issue of Outside magazine had already generated hundreds of comments and more than 95,000 shares on social-media outlets such as Twitter and Facebook. The responses ranged from the vitriolic — "the world will always need ditch diggers," wrote one commenter, "so if that's what you want to raise then have at it" — to the grateful and inspired. Hewitt is quick, and careful, to explain he's "not trying to tell anybody what to do," nor is he advocating for shutting down schools. He's merely telling the story of his own family members and what works for them. As a society, he says, "we've really lost touch with the ability to intuit what is right for ourselves and our families." Disclaimers aside, the last seven years of "unschooling" have only made Hewitt more confident in the choices he and his wife have made for their children. As idyllic as the scene in Cabot is, he's forthright about the challenges. 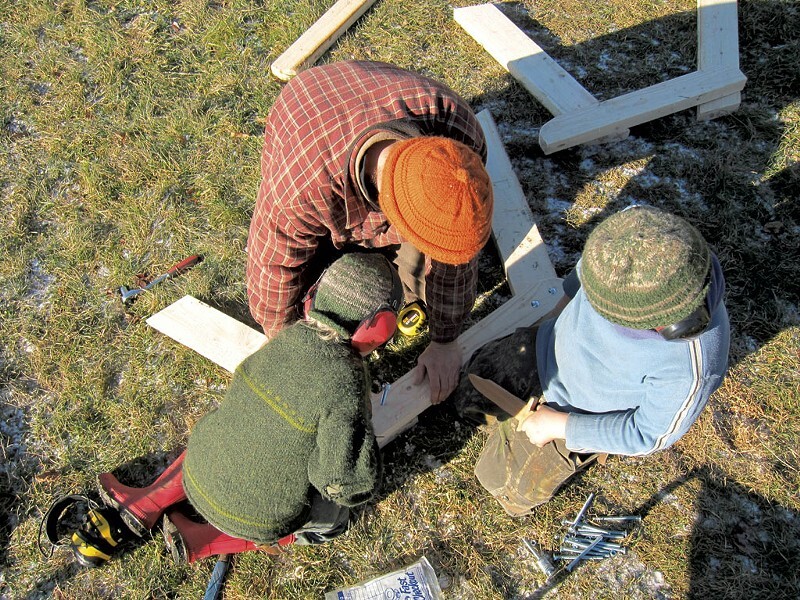 Children take pleasure in being useful, but including Fin and Rye in the work of the farm, especially when they were younger, required immense patience. There's another challenge: Now that the boys have grown accustomed to the rare autonomy they enjoy, Hewitt writes, they've become "enormously particular about how they pass their time." They still contribute willingly to the work of the house and farm, but they're also stubborn. "It's not really convenient to raise strong-willed children," says Hewitt, only half joking. But that's the point, after all: to raise children who recognize their passions, who question convention, who think critically. What about a plan for the future? Will the Hewitts insist on GEDs, or college? "There is no plan," Hewitt says. He trusts that, just as they have all along, the boys will provide their own. A version of this story appeared in the August 27, 2014 issue of Seven Days.